The Dow Jones Industrial Average hit a new record high Tuesday, closing above 19,000 for the first time as the stunning market rally since the election of Donald Trump continued on Wall Street. The blue chip index went as high as 19,044 in late afternoon trading and finished the day slightly below that. The Dow, which includes 30 brand name stocks such as Coca-Cola (KO), Walmart (WMT), Microsoft (MSFT), Disney (DIS) and General Electric (GE), is now up nearly 4% since Trump defeated Hillary Clinton to become the next president of the United States. The S&P 500 and Nasdaq are also at record highs. Of course, it's not as if investors have suffered during Obama's tenure. The Dow has nearly tripled since hitting a low of about 6,400 in March 2009 -- shortly after Obama took office in the midst of the Great Recession. The latest rally is spectacular in how the market has swung in the weeks leading to the election and after. CNNMoney's Fear and Greed Index, which measures seven indicators of market sentiment, is now in Greed territory and is not far from Extreme Greed levels. It was registering Fear just before the election. That's because investors were initially wary of Trump. The market actually fell for nine straight days in the two weeks leading up to the election, as Trump's campaign gained momentum due to concerns about Clinton's emails. Ironically enough, the market rallied sharply the Monday before Election Day after FBI Director James Comey cleared Clinton -- an event that many investors interpreted as a sign that Clinton would wind up defeating Trump after all. So what's changed? 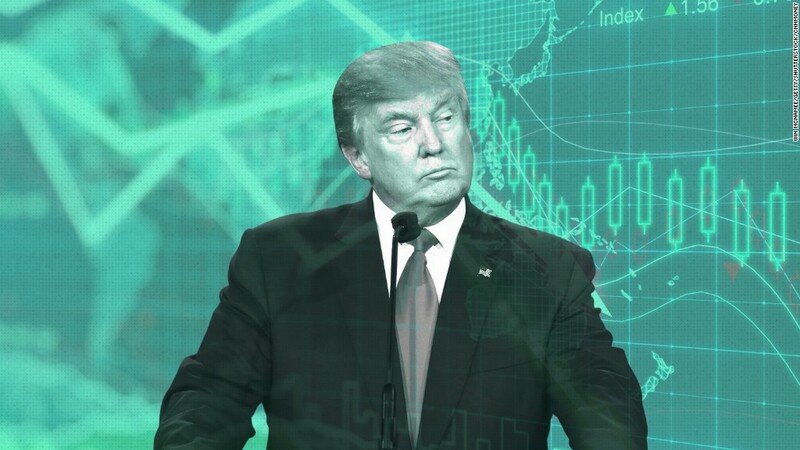 The market now seems to think that Trump's win, combined with Republicans retaining control of both the House of Representatives and Senate, should mean that many of Trump's market-friendly policies will be enacted. Investors are betting Trump will get a stimulus package passed that will help rebuild much of the nation's infrastructure. That's why stocks like Caterpillar (CAT) and U.S. Steel (X) have surged since the election. The market is also betting that Trump may roll back some of the provisions of two signature laws passed during the Obama administration -- the Affordable Care Act and the Dodd-Frank Wall Street Reform and Consumer Protection Act. Drugmakers Merck (MRK) and Pfizer (PFE) have rallied on hopes that the Trump administration won't focus so much on reining in the price of medications as Clinton might have. This could also be good news for health insurers. And Wall Street banks JPMorgan Chase (JPM) and Goldman Sachs (GS) have popped on expectations that Trump will be more lenient to financial firms. The latest rally caps a very long bull run for the stock market during the Obama presidency. At the beginning of his term, the U.S. economy was still in the midst of the Great Recession. Stocks had plunged due to fears about the health of big U.S. banks. But the combination of stimulus from Obama and Congress and interest rates near zero from the Federal Reserve helped to jumpstart the markets and economy. Tech stocks and retailers in particular have helped lead the rally. Consumer stocks could continue to do well under Trump. Investors are betting that economic stimulus combined with the possibility of lower taxes could put more cash in the pockets of average Americans. As such, market strategists at RBC put out a report Monday that highlighted 40 large stocks that could thrive for the next four years. The list was dominated by banks,. retailers and healthcare companies and included well-known firms like U.S. Bancorp (USB), Capital One (COF), Kohl's (KSS), Best Buy (BBY), Aetna (AET) and Anthem (ANTX). But America's largest companies aren't the only ones that are on fire lately. The Russell 2000, an index that holds smaller U.S. companies, also is at a record high. Investors are betting that Trump's efforts to bolster the U.S. economy will be great for smaller companies, which tend to have less exposure overseas. Along those lines, the market strategists at RBC put out another report Tuesday that featured 40 smaller and mid-sized companies that could do well during a Trump administration. That portfolio was also dominated by financials, retailers and healthcare. Big Lots (BIG), Rent-A-Center (RCII), PharMerica (PMC) and Genworth Financial (GNW) were among the companies making the cut.